We used to use paper towels to clean everything, until I read about how much waste one household creates by using paper towels – real simple magazine did an article about lessening your footprint on the earth, and everyday changes you can do to make a difference. I’ll write more on that later, but for now.. Its a great idea to get about 20 of these buggers, and when you finish using them, throw them in the washing machine and you’re good to go! 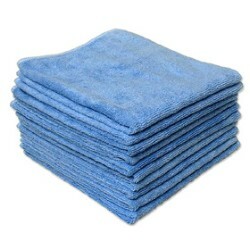 They are microfiber so they pick up much better than paper towels. and they are really absorbent – AND great on glass! I bought mine from http://www.microfibertech.com/, about $10.00 for a pack of 10.